He was the first person I saw when I walked onto the compound, wheeling my suitcase behind me. He looked up, under a ball cap, and smiled warmly. “Bon swa,” I said. “Bon swa,” he replied in a quiet voice. 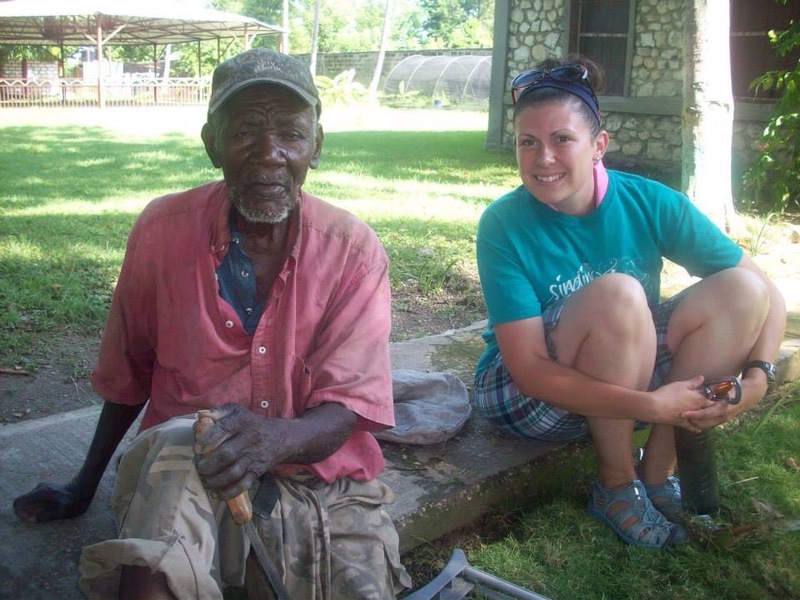 He visits the missionaries on the compound daily and sits on the ground outside their homes. They are his friends and he graciously cuts down the weeds along the sidewalk with his machete. Perhaps it is his way to give thanks for the meals they provide him each day, but he is diligent to care for the ground around him. “Does he sing?” I asked her. 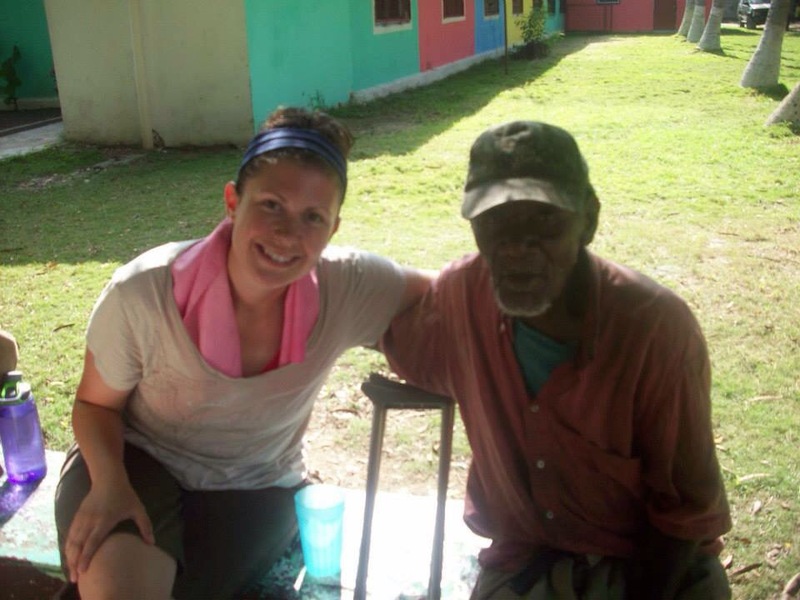 I had learned to say the word, “sing,” in Haitian Creole before the plane had even landed and had written it on an envelope in my Bible. Somehow I knew music would be a likely form of communication for me. In the early stages of my trip, I was rather convinced that I didn’t have much to offer…but I was believing that God had told me to go. I didn’t know what I could possibly have to offer (as far as helpful skills were concerned) but I knew that if all else failed, I would give singing a go. I unloaded my carry on in my little room and found the piece of paper in my Bible. I read the word to myself several times in hopes of memorization. In the coming days, my conversations with Efwa were basically repeating like a broken record. “Chante, Efwa?” I would ask with a smile as I sat beside him. “Pita,” he would reply in a kind tone. I’m embarassed to say that upon hearing his response the first time, I promised to return with pizza. Yep. I literally thought my new friend was requesting pizza for dinner…until a missionary clued me in, despite hysterical laughter, that “pita” is Haitain Creole for “later.” So…no pizza needed. Noted. That was a legit mistake, no? This continued for days. The words, “Bon jou,” “Bon swa,” and “Oy Eevwa,” were mutually exchanged in the coming days and I resigned to the assumption that those exchanges would be the extent of our conversations. Saturday, June 7, 2014 held a moment that I will never forget. Truly. In my life, I am going to remember the special days: family vacations from my childhood, my wedding, the birth of my children, graduations, and the like. In the midst of those expected beautiful moments, I will remember this. Without a doubt. “Amen!” responded our group that had gathered on this sidewalk. As he finished, I said, “Trey Bien, Efwa. Mesi!” He extended his hand to me and we shook hands. Next, I am pretty certain that he asked Aunt Teresa to bring him breakfast. Efwa can praise Jesus, sitting in the grass, with only one leg, wearing the same clothes he has been wearing all week. Praise God who is worthy of all praises. “There Is a Fountain,” will always be a favorite of mine now. Later, Efwa sang, “Trust and Obey” with me. Then, we headed to the park where I saw a humble market, a community of beautiful gardening women who kindly showed three of us around. My journal continues with other memorable accounts from the long and blessed day in Haiti but continues on to another story of Efwa. This morning, after singing with Efwa, he quietly said something in Haitian Creole and I found a nearby Haitian teen boy to translate. “Wi!” exclaimed Efwa, as he continued to speak in Creole. “What is Efwa saying now?” I asked the young boy in his white sunglasses and trendy teenager jeans. My teammate, Mallory and I listened as Efwa continued sharing his heart with us. “…and what does he say now?” I asked the Haitian teen. “Wi!” Efwa responded as if he sensed my comprehension of what he had said. I asked the Haitian teenager to ask Efwa if he loved Jesus. He responded affirmatively and I asked the boy to please tell Efwa that I would see him again in Heaven. I cannot even type those words without getting a lump in my throat because of the overwhelming goodness of God in that conversation. My eyes fill with tears when I think about the Creator, writing the stories of His children miles and miles across oceans and the Savior that gave all~a promise that this life will not be our home. It will not be the end. Paradise. In that moment, my heart understood Heaven in a new way–a way that it could never comprehend the goodness ever, ever before. Jesus, the hope for all nations, for all people, no matter the story of the earthly life. I returned from Haiti with a bazillion stories, talking a mile a minute at two in the morning because that is how I roll. In the months that followed this God-sized adventure, I told and retold my most memorable moments. To my own surprise, this moment was the one that came back time and time again as I recalled the lessons God had taught me in a new-to-me part of His world. A friend messaged me and said she recognized Efwa from my pictures as perhaps being the same gentleman from a painting her husband had painted. 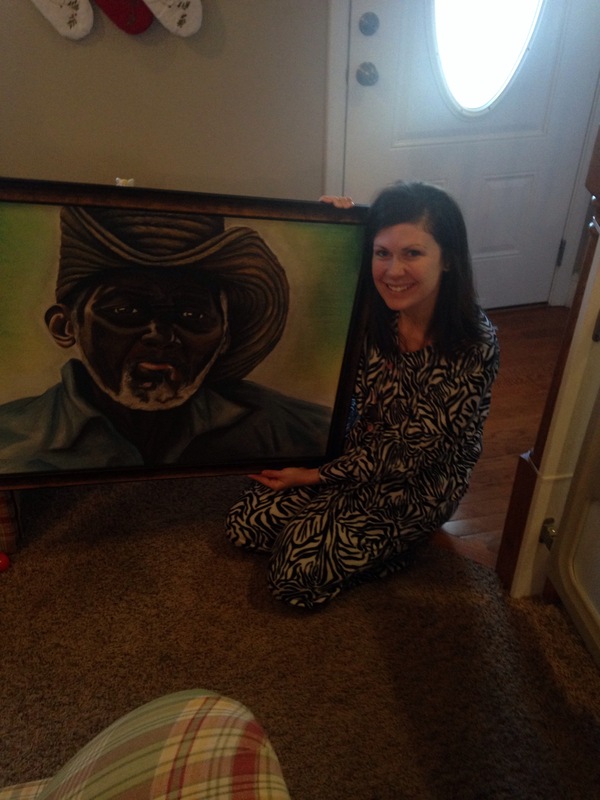 I was quite sure it couldn’t be the same person until she told me that her husband had painted this portrait based on a picture a man from my community had taken in the same location years before. On Christmas morning, my husband and children carried this into the living room. I might have cried…like maybe a gallon or two of tears. Best. Christmas. Present. Ever. My husband shared with me later that he had bought the painting after he had heard me say something about Efwa as I was retelling his story once. If Efwa can praise God sitting on the ground with one leg while cutting weeds with his machete, then I can praise God in all circumstances too. 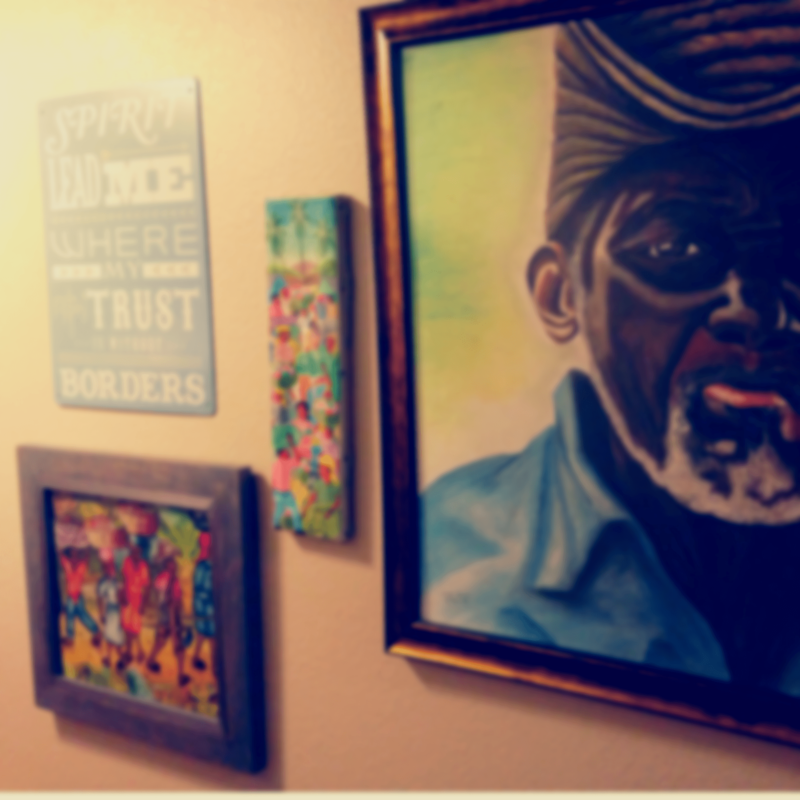 So it hangs in the hallway, a picture of a far-away friend: a reminder to praise God in all circumstances, a reminder that it is good to help our brother if he needs help, a reminder of God’s creation, a reminder that this world is not our home, and a reminder of our true destination ~Paradise. I still don’t quite comprehend the reasoning behind my love for Haiti. I didn’t anticipate this. I was just signing up for eight days. Eight days. Surprisingly, a big part of my heart has been captivated by the people across an ocean in a way that only God could have purposed this kind of calling. I am returning there soon. I don’t know how many times I will return in my lifetime. Maybe just the two. I know this: one day, we will all worship together in Paradise. We will all run, completely restored, to the King worthy of all praise in all circumstances. Bondye Beni ou means “God Bless You,” in Haitian Creole.